This collection of 11 personal essays, memoirs, and true stories from Townsend 11, a group of award-winning writers, takes readers on emotional journeys and adventures from California to Croatia to China and back, Ethiopia to Egypt, England to New England, and Hawaii to Hot Springs, Arkansas. Laugh out loud on a family camping trip with an irascible dad, travel down the Nile and through history, take a hilarious and poignant peek inside the airline industry, race a motorcycle across a Chinese desert. You’ll discover a hidden lake Jane Austen would have loved, feel the bittersweet memories of a summer romance turned dangerous, meet an inspirational woman gifted with wisdom, courage, and boundless love, chortle at the funny case of mother-daughter mistaken identity, and enjoy the misadventures of a dog trainer training a chicken. A Peace Corps Volunteer decides not to embrace a unique man and a strange country forever. A daughter bonds with her father. Life. Love. Travel. Humor. Lessons Learned. 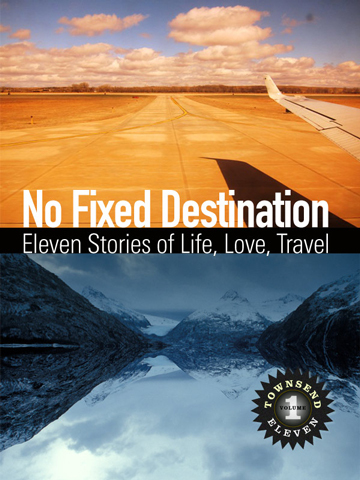 If you like to read the stories published in Travelers’ Tales, Lonely Planet, and other creative nonfiction anthologies, you’ll love No Fixed Destination. Take advantage of our promotional pricing now! No Kindle? You don’t have to own an e-reader like a Kindle, iPad, Galaxy or other tablet to read our e-books. You can probably read them on a device you already own.